By Srinivas Chowdary Sunkara // petrobazaar // 16th March, 2019. In India, The National Oil marketing companies have reduced the price of bituminous products for the first second half of Mar, 2019 wef 16/3/2019. All the grades of Bitumen prices are revised down by Rs.10/- per mt or 0.034 pct from previous fortnight prices. 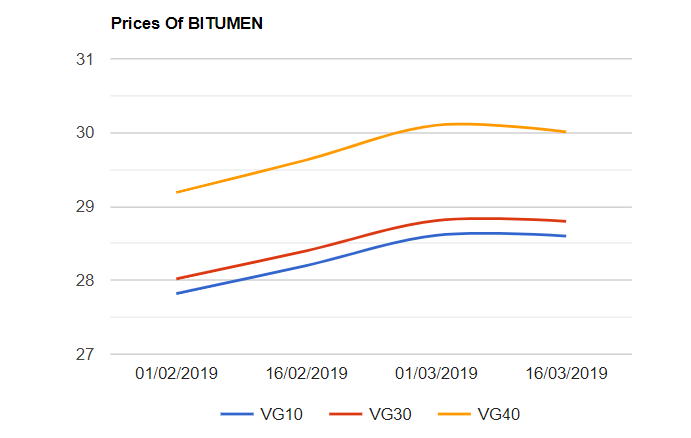 As per the latest publication of oil marketing companies, In Visakha, The basic prices of Bitumen VG-10 (Bulk), Bitumen VG-30 (Bulk), Bitumen VG-10(packed) and Bitumen VG-30(packed) product prices were reduced by Rs.10 per Mt each to Rs.28600/-, Rs.28800/-, Rs.31900/- and Rs.32710/- per Mt respectively. Bitumen VG-40 Bulk product prices went up by Rs.10/- per mt to Rs.30010/- per Mt.